Thanks to recent gas prices, convenience stores are seeing a dramatic increase in foot traffic inside. From soda to coffee and beyond, customers feel a little freer to snack when they're spending less at the pump. 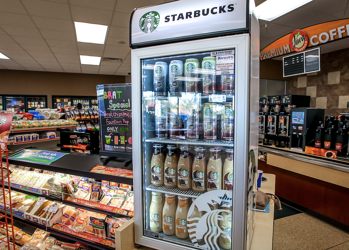 In fact, a recent survey of convenience stores showed that 78 percent reported an increase in sales for 2015. A survey from NACS indicated that 41 percent of drivers went inside convenience stores in January 2016, whereas only 35 percent did in January 2015, a promising increase. Since customers are spending less at the pump, they're more likely to treat themselves to a purchase inside. But not just any purchase. More and more, customers are making a "premium" beverage purchase. What is a Premium Beverage? So, what exactly makes a beverage a premium beverage? Gone are the days when people just stopped into a convenience store for a quick drink. Customers today are looking for more options. They're looking for drinks that provide vitamins, a jolt of energy, all-around health benefits, or a unique taste. As far as the convenience store market goes, premium beverages are generally considered to be those that go beyond soda and water. While standard beverages do still make up the majority of the market, premium drinks like Rockstar Energy, Muscle Milk, Propel Water, Naked Juice, and bottled Starbucks coffees are all on the rise. It's no secret that many consumers are becoming more health conscious, and opting for drinks that may be a little healthier. Premium beverages like waters and juices are incredibly popular right now. Over 50% of customers said they would visit a convenience store more often if there were more healthy food and drink options available. In addition, over 50% of people said they are now specifically seeking out healthy, premium drinks. The convenience store chains that are adapting to the changing market and adding healthier alternatives are seeing the results in their bottom line. Beyond the health benefits, there's another factor at play in the rise in these beverages. These drinks are the ones often found peeking out of gym bags, purses, and car cup holders of celebrities. It's a trend that's been around as long as there have been people with "celebrity" status, and it still holds true today that the average consumer wants to try the same drinks as the stars. There's a certain "cool" factor at play, especially among the coveted young demographics. But the premium beverage trend doesn't stop there. It extends to the alcohol market as well. The craft beer scene has exploded in recent years, and customers are looking for their favorite local brews. Oftentimes, these brews can be difficult to come by. Currently, convenience stores sell one-fifth of the volume of craft beer as other channels. There's an incredible opportunity for growth here and in a high-dollar market, a win-win. If you can become known as a "go to" source for those craft brews, you'll gain the fans of those beverages who will of course, end up making other purchases in your store. As a convenience store owner, you're very aware that the majority of your profit comes from inside purchases. Your margins on actual fuel are so razor thin that there's just nothing to be made there. Since customers are contributing to convenience store sales more than they ever have before, you need to have what they're looking for. Sodas are still the major player, but if you want to truly stand out, you need the beverages that your customers can't find anywhere else. When you really take a look at it, the issue is quite simple. Market interests have changed, and your customers are looking for these beverages. Why not stock what you know they'll likely buy?